awesome tutorial E! :) I want to try the felt rose... so pretty! I love this pincushion and tutorial - another fabulous project from the fabulous Elizabeth! Great tutorial and it is ever so cute - the felt rose is such a great idea too. Thanks!!! Oh my E!! I absolutely am going to make the felt roses. If it is okay, I would love to sometimes add them to my cupcake cottages? I know I already have a terrific pincushion from you...but I think I will be a little greedy in this case! Do you attach the figurines in some way? I think your creations are wonderful! I like watching your creative process. It could not be cuter! Another adorable pincushion (but they're really so much more!) Like everyone else, I noticed that felt rose too, I'm wondering what could I put one on, I'll definetly remember that. Just curious, do you buy your felt somewhere locally or online? It's so much nicer than any I've ever seen. You are truly amazing.. i love how you worked the little vintage wooden pieces into your pincushion.. i think it is a very creative idea and wish you had an etsy shop! I wish you had an etsy shop, too. Turtles make me think of my mother. You're so sweet Elizabeth! I have been thinking about making patterns for my pincushions. I'll let you know when I get them done. I love your little turtle pincushion. Don't put me in your drawing. 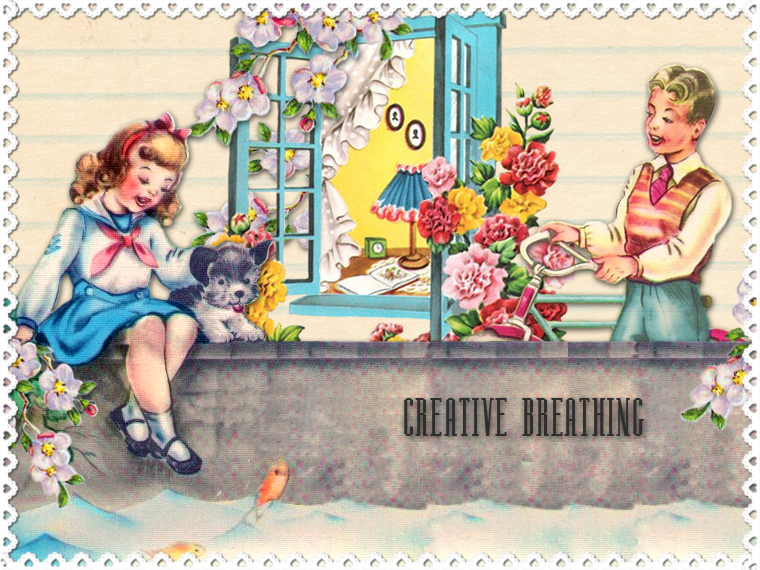 I am lucky enough to own my own "creative Breathing" pincushion and I think I everyone should be lucky enough to win one!! Thank you for sharing this wonderful tutorial Elizabeth. I always did wonder how you attached these little ornaments...now I know, you glue them on! how cute. I make pinkeeps also, and put my floss on differently.. (I wrap it very tightly around and tie underneath each time around. I'm going to try your way, it makes more sense! 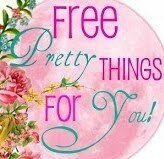 would love to win one of your creations.. or.. if you ever want to do a pinkeep swap.. Id love to do a swap with you! I love that felt rose idea. I will definitely be trying that out on some little brooches! Thanks for the idea! I came across your bog while visiting someone else's. I was totally taken with the pincushion she showed in a pic, so here I am. I can't sew very well at all, so I really appreciate the tutorial. I love vintage toys and findings. Thanks for the inspiration to try something new!!! Great tutorial E. The cutest pincushion. I have hundreds of those alphabet beads. Now I can do something with them. Really love the roses. What a great tutorial. Thanks so much! I enjoyed reading about Doris Day, below. My daughters LOVE her, too, because of all the D.D. movies I rented when they were young. One year I gave my oldest one 'Calamity Jane' for Christmas so we wouldn't have to rent it anymore. : ) Also, your felt owl is truly a work of art!!! http://www.characterconstructions.com/. Once there, click on Character Constructions, then on Theater of Dreams, and it's set #11. I used their wing stamp on a Bingo card for my wings. Let me know if I can answer anything else. Oops, forgot to say don't count me in the running since I've already won one of you beautiful pincushions, but I'd still like to know where you buy your felt. Your pincushion is adorable as are all of your creations and thank you for the tutorial. I am curious about the wooden figures - they remind me of a lamp and mobile I bought for my baby girl who is now - yikes - 40 years old! Do you thrift them or did you luck into a factory closeout :-)? LOVE your pincushion! 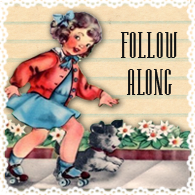 I have been so inspired by the same as you and have wanted to create my own pincushion as well. I love all of the embellishments!!!! Thank you so much for the tutorial!!! I've made several biscornus and had no idea how to tie off my thread when I was finished sewing the second button. Now I know! Thank you so much for that and for sharing how you make your pincushions. By the way, I popped in to get another copy of your bluebird pattern -- I cut out the pieces and somehow lost one and was planning to make a blue bird today. I might need to add a pincushion too. Thanks again! Have a great holiday weekend!